There's a reason why homeowner's and small business owners are turning to XRefer when they need fast, fair priced dumpster rentals in Chula Vista, CA. Whether you just need a cheap 10 yard dumpster for a day or two, or you need a long term rental of a few 40 yard roll off dumpsters at a Chula Vista construction site, XRefer has the solutions that you've been looking for. Our customers in Chula Vista have the benefit of tapping into XRefer's network, which allows them to choose any size dumpster, while also only working with the most reliable, affordable local haulers. When you rent a dumpster in Chula Vista with XRefer, you can rest easy knowing that we've researched the market and that your experience will be fast, easy and affordable, without the hidden fees or hassles that often come along when renting a dumpster in Chula Vista. When you are getting ready to rent a dumpster in Chula Vista, the first step is determining which size suits your needs the best. You will need to estimate how much waste you need to dump, which can be done my measuring your pile of debris by the length and width and dividing by 27 to get the cubic yards of waste. Once you have the cubic yards that you'll need you can take a look at the capacity for 3, 6, 10, 15, 20, 30 and 40 cubic yard dumpsters in Chula Vista and choose one that will work. It's important that you have enough space, so if you are on the border between two different sizes you should choose the larger one, or you may have to order another dumpster, or pay for it to be hauled to the junk yard in Chula Vista and back to your property, which will cost more than just getting the right sized roll off right from the start. Residential / Small Dumpsters - These 3 to 8 yard residential dumpsters are great for home improvement projects in Chula Vista. From bathroom remodels and spring cleaning to larger yard work or even just apartment complexes general waste management, these can be used for a variety of different projects. Commercial / Construction / Roll-Off Dumpsters - these are the most common type, and are generally what people think of when they are looking to rent a dumpster in Chula Vista. Sizes for roll offs in Chula Vista range from 10, 20, 30 up to 40 cubic yards. These are often used at businesses, construction sites, large housing complexes and other places where a lot of waste needs to be removed. If you still aren't sure what size dumpster rental you need for your next project in Chula Vista, just pick up the phone and talk to one of XRefer's partners. Our partners have years of experience helping customers choose the right size for their needs, and they are happy to answer your questions, give you price estimates or help in any other way. In some cases you can get a same day delivery, but not always. If you know that you will need a dumpster delivered in Chula Vista on a certain day, it's always a good idea to schedule it a few weeks in advance to make sure there is availability. How much does it cost to rent a dumpster in Chula Vista? Chula Vista dumpster rental costs range from $150 to $550 depending on the size you need, and what you are disposing of. Deliver is often included in the quoted Chula Vista dumpster cost, but in some cases it's in addition, so it's important to ask what the quote includes. If it's added on it usually costs about $100. Do I need a permit to keep a roll-off dumpster on my property in Chula Vista? Depending on where you plan to keep your dumpster, you may need to obtain a permit from the city of Chula Vista. When you obtain an estimate from local Chula Vista dumpster companies they'll let you know if you need a permit or not, and if there are any fees associated with it. How long can I keep the dumpster at my property in Chula Vista? You can keep the dumpster at your property for as little as one day up to 28 days. If you are working on a project and need to have weekly hauling, your local Chula Vista dumpster company can set that up for you. Do I need to be there when my Chula Vista dumpster rental is delivered or picked up? Can you pick up the roll off dumpster in Chula Vista the same day you drop it off? Do you offer dumpsters for sale in Chula Vista? It's possible to find a Chula Vista company that will offer dumpster sales, but it's rare. In most cases it just makes more sense to rent anyway. 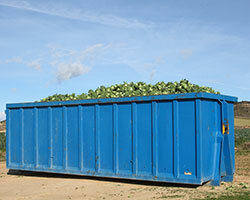 Ready to start comparing prices on a dumpster rental in Chula Vista? Complete the quick quote form or give one of the verified companies in Chula Vista a call right now. You won't find better service or lower rates anywhere else! There's a high demand for Chula Vista dumpster rental. Call or request a quote right now! Serving: Eastlake Trails, Eastlake Vistas, Estlake Greens, Otay Ranch, Terra Nova, Thomy Locust Pl and throughout Chula Vista. Serving: Eastlake Trails, Estlake Greens, Terra Nova, Village Center and throughout Chula Vista. Serving: Eastlake Vistas, Estlake Greens, Southwest, Village Center, Yosemite Dr and throughout Chula Vista. Serving: Bella Lago, Eastlake Vistas, Eastlake Woods, Paseo Ranchoero and throughout Chula Vista. Serving: East Lake, Eastlake Trails, Paseo Ranchoero, Rancho Del Rey, Yosemite Dr and throughout Chula Vista. Serving: East Lake, Fenton St, Lynwood Hills, Otay Ranch and throughout Chula Vista. Serving: Bella Lago, Golf Course, Paseo Ranchoero, Rolling Hills Ranch, Sunbow, Village Center and throughout Chula Vista. Serving: Amphitheater And Water Park, Bella Lago, East Lake, Fenton St, Yosemite Dr and throughout Chula Vista. Serving: Bonita Long Canyon, Golf Course, Paseo Ranchoero, Southwest, Village Center, Yosemite Dr and throughout Chula Vista. Serving: Amphitheater And Water Park, Fenton St, Rancho Del Rey, Sunbow, Thomy Locust Pl, Village Center and throughout Chula Vista. Serving: Bella Lago, Eastlake Woods, Fenton St, Paseo Ranchoero and throughout Chula Vista. Serving: Bella Lago, Estlake Greens, Northwest, Otay Ranch, Rancho Del Rey, Yosemite Dr and throughout Chula Vista.